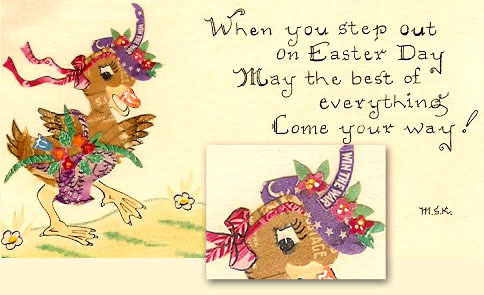 Easter cards customarily combine a religious message of hope and renewal with images of a kinder and gentler season. 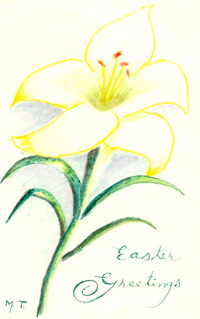 Whether adorned with Easter eggs or Easter lilies, they celebrate the promise of brighter days ahead. Homemade Easter cards are included in some of the Manuscripts & Folklife Archives holdings of WKU’s Department of Library Special Collections. One is from Mazie Lee Thomas, a largely self-taught African-American folk artist who resided in Adairville, Kentucky. Perhaps the most unusual card is one created by Mary Alice Kimbrough in 1944. Made with tiny, hand-cut pieces of postage stamps, the colorful greeting was sent to President Franklin D. Roosevelt and was undoubtedly a unique addition to his beloved stamp collection. Click on the links to access finding aids for these collections. For other Easter materials in the Department of Library Special Collections, search TopSCHOLAR and KenCat.